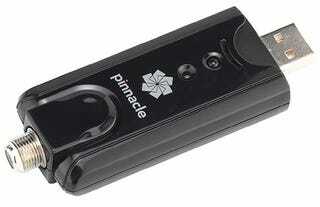 Pinnacle's PCTV HD Stick just lost a couple of features and got even cheaper. Now you can use this little USB tuner to turn that PC into a personal video recorder for just $99.99 instead of the $129.99 of the PCTV HD Pro Stick that's still available. What's the diff? The PCTV HD Pro Stick (What? There are Pro TV watchers? Sign us up), announced late last year, adds a mini remote control and the ability to capture from sources such as set-top boxes and camcorders. So if there are HDTV stations you can receive over the air where you live, now your PC is also an HDTV, giving you that live or recorded 720p goodness just by plugging this doodad into a USB port, setting up its mini-antenna, and firing up Pinnacle's PVR software. Hey, wait a minute. We've had some relevant experience with the PCTV HD Pro Stick we can tell you about. Let's hope the PCTV HD Stick's synchronization between sound and picture has improved since we tested the PCTV HD Pro Stick back in October, where our pal Louis likened its awkwardly synced output to a Japanese karate movie. That could get old fast, even for this non-Pro model's lower price of $100. And, unless reception is really strong where you live, that $30 extra for the Pro model's ability to grab a signal from a set-top box might be money well spent, and you get a remote control thrown in for that price as well. We like the idea of recording HDTV over-the-air, completely bypassing any bothersome DRM and snagging those HDTV shows for our own use it as we see fit right there on a PC. We're having a hard time seeing how the $30 price difference here actually addresses a different market segment, but if you don't want a remote control and the ability to hook up to set-top boxes and VCRs, why should you have to pay for it? Maybe that one-penny-under-$100 number holds some kind of special marketing magic.